Every day is a new day and nowhere is that more applicable than in the perennial garden. The picture above is three days old and today’s picture would look different. It’s three days old because I took it before I headed for a long weekend at the lake. That’s also why you are getting this issue of “Dallying” on a Monday. When we return tomorrow that piece of perennial garden will look noticeably different and that’s the great joy of such gardens. The bright purple spike of Liatris brightens the foreground and a range of Daylilies fills much of the space. There are a few Lilies quietly leaving town while the Phlox are just arriving in all of their bright red glory. The Tree Rose is just starting to throw a new flush of blooms in the back corner while the Thyme paths are a thick, green, carpet now that their bloom period is over. There are always signs of things to come. Several large clumps of Iris await their dividing next week. There are always enough such chores to keep me out in the middle of those gardens so that I can continually admire the evolving show. 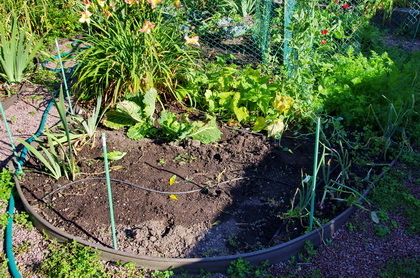 A bare patch of ground at the beginning of August must be in the vegetable garden. The spring Broccoli, Cauliflower and Pak Choi have all gone to the kitchen to be enjoyed and now it is time to replant them so they will flourish in the cool fall months and once again grace our dinner plates. This year I’m going to try direct seeding some of these delights into that bare patch of ground. The trick will be to keep the soil moist enough for germination. After they appear, will I be able to keep the various creatures that wander the garden, from devouring them? You can see the green fence posts that held up the rabbit fence in the spring. I took it down when I needed easier access to weed, thin and harvest. I will also do a backup and start some seeds in cells in a protected location for later transplanting. 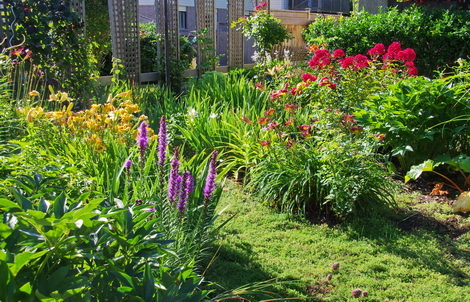 There are several similar spaces e in various locations in the garden. The Pea fence in the background has also been cleaned of all the old finished vines and some new Pea seeds will be finding their way into that soil, in the next few days. Bare soil in the garden is just a resource that must be used if I want to maximize our food production. 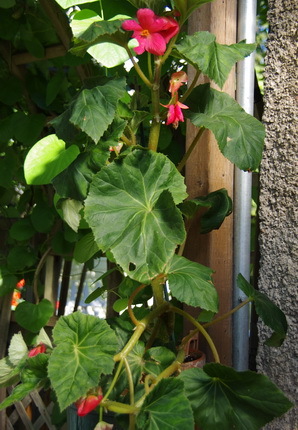 This lovely tall Tuberous Begonia has shown amazing growth this year. It’s a new tuber that I bought in the spring and despite it’s wonderful growth it is very disappointing. Tuberous Begonias produce separate male and female flowers and the males are the large spectacular blooms. I try to remove the female flowers as soon as possible to let the male flowers have all of the water and nutrients. This plant has only produced female flowers so far this year. That’s why you see the small bloom with the single row of petals. I throughly enjoy the company of women and delight in them enjoying my gardens but in this case they are less than welcome. If this plant continues to produce only female flowers all season then the tuber will probably not get to spend the winter in my storage. Is it the plant, the season, the increased fertilizer or just a quirk of nature? If any of you have any theories send them my way. There, I’ve asked the question this week and you get to answer it, if you can. There are no more questions because the sunshine and blue water of the lake are calling my name.